On your standard list of household herbs are basil, cilantro, parsley, sage, rosemary and thyme. The last four may have been a Simon & Garfunkel reference. There are probably many reasons why the iconic American pop duo named thyme last in the sequence – one being related to rhyme scheme. But thyme is actually an extremely helpful spice to have around, and nutritious to boot. Let’s take a look at why thyme is so wonderful. It’s a great source of nutrients. BBC Good Food says fresh thyme is an excellent source of vitamins A and C, iron, manganese, copper and even dietary fiber. Although dried or ground thyme is something to definitely have in your spice cabinet, it won’t have the same amount of nutrients, so fresh is better. Ground thyme will remain good for up to six months, but you should store fresh thyme in the refrigerator, wrapped in a damp paper towel to keep it fresher longer. It kills certain bacteria that live on fresh produce. Next time you wash some apples or carrots, try using previously-bowled water infused with thyme in order to lower the percentage of microbes on your fresh produce. While thyme is really only effective in eliminating Staphylococcus aureus, it can lower the counts of multiple microbes, making it a natural germ killer. It’s used in tons of different products, cosmetic and otherwise. Thyme essential oil is commonly used as a scalp treatment and is believed to help prevent balding. It’s also used to stop acne breakouts, as it tones skin and temporarily lowers its ability to produce oil. Additionally thyme essential oil is thought to fight candida overgrowth, on your skin and elsewhere, helping to prevent yeast infections. Thyme is also thought to be a natural bug repellent. You can use essential oils in small open containers to create a patio perimeter, or just place some around your home to keep mosquitoes, moths and ticks away from your windows and front doors. It’s easy to prep and awesome to use. Thyme goes with basically everything. Professional chefs use it in tons of recipes, with everything from broccoli to ricotta cheese to lean ground beef burgers. As for using fresh thyme, you simply need to rinse off a sprig (or five), hold it taut, and run two fingers down the stalk to remove the leaves quickly. Chop, squeeze, rip, or sprinkle – thyme is sure to add a new element to whatever dish you use it in. 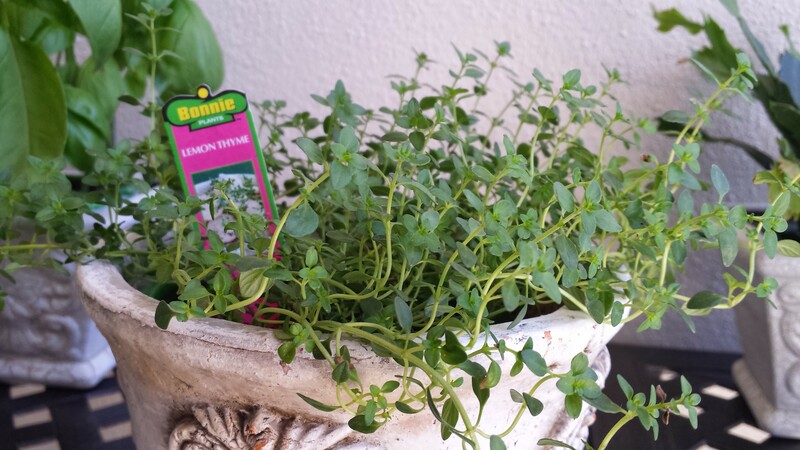 Though the lemon thyme plant is featured above today’s blog, there are actually many different types of thyme, so choose whichever best suits your needs. It’s definitely time to rethink my current use of this herb. Thanks for the useful and “thymely” information!